Baby formula is not cheap. Formula costs for the first year of your baby's life can exceed $1,500 dollars per baby. 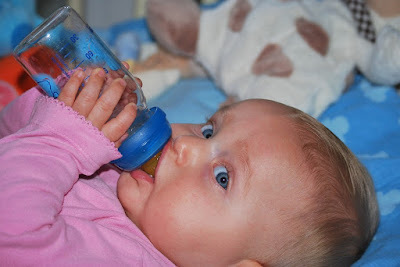 The average baby eats 21 to 25 ounces of formula each day. The average cost of formula is $0.20 per ounce. That works out to $35.00 each week, $150.00 each month, and $1,825.00 in the first year. Use your own brand and local costs to work out what it will cost you to feed your baby formula. Or check out this formula cost calculator to see what your specific formula brand will cost you to use. Also check out our Huge List of 101+ Breastfeeding Freebies! ღ Enfamil - Join Enfamil Family Beginnings® for up to $400 in gifts and a chance to win free formula for a year! You'll get trusted advice for every stage of your baby's development, plus discounts on Enfamil products, free samples and goodies. ღ Similac - Join Similac® Strong Moms® Rewards program offers personalized gifts and benefits customized for your specific needs. Plus, you'll recieve up to $400* in savings and benefits. ღ MyGerber - Sign up for MyGerber and fill out your address info to get samples, coupons and more. They have interactive tools from growth trackers to menu planners, coupons and offers, and your Personal Baby Expert, Dotti! She's your go-to girl, just text her anytime with questions on feeding, sleep or even breastfeeding. -- looking for low cost or free baby formula samples of Parent's Choice or Parent's Choice coupons for formula? They created a low price way for caregivers to try a Parent's Choice Infant Formula 12-ounce sample size for approximately $8.98. -- Baby registries can save you money: You get only the gifts you need and no duplicates. If you haven't started your registry yet, think about choosing Amazon.com. If you are already a Prime member, you are eligible for limited time offers, such as a parenting eBook or baby welcome box (including baby foods, lotions, shampoos, a pacifier, breast pads, wipes and more). You may also receive discounts and maternity savings down the road. After you or someone else makes a $10 purchase off your registry, click the Claim Now button to receive your free gift. If you don't have Amazon Prime yet, you can sign up for a free trial. -- Sign up for Enfamil Family Beginnings®, your source for nutritional advice, support, online forums and more! 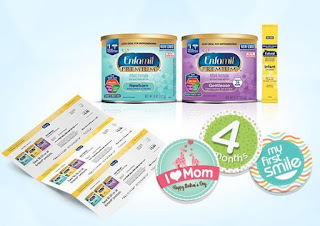 In addition to great resources like the Your New Baby, Your Growing Baby, and Your Toddler magazines, you will receive free formula samples, free baby samples from their partners, printable coupons, and access to Enfamil videos, articles as well as community chats and expert forums. Don't miss this opportunity to learn more about your baby's development and to get answers to your questions from both experts and fellow mothers. ღ Similac -- Sign up to the Similac Club - for up to $175 in free gifts, free formula, Similac rebate cheques and information on your baby's development. -- Once your registration is confirmed you can look forward to receiving unique mommy perks for every stage of your little one's development, which may include: Up to $20 in Nestlé Materna coupons, an infant formula sample and other infant nutrition samples. Newly re-designed, stylish Nestlé Baby Bag with change pad. The Nestlé Start Healthy, Stay Healthy™ Baby Feeding Guide. Customized emails with tips, online tools, and videos. Exclusive savings and more! -- Sign up for all the latest news, hints and tips from Heinz Baby. Monthly emails with great prize giveaways. Helpful nutritional information, recipes for your little one, and meal planners. Exclusive trials of our new products. Coupons with great savings. -- When you sign up as a member with Family.One you automatically become eligible for free products from some of your favourite brands. -- Start a Canadian baby registry on Amazon, you’ll instead receive a free set of Fisher-Price maracas. After you create your registry, add the Fisher-Price Rattle'n Rock Maracas Musical Toy to your registry and then to your cart. When you checkout, use the code REGISTRYTOY. You will also receive a 10% discount on items sold from Amazon in the baby, grocery, drugstore and toy departments. ღ Nestle - Simply select the Nestlé website created for your country. Thank you for the formula coupons, just saved me a lot of money! I have posted tons of freebies for BFing moms! I will fix the More section - thanks for letting me know!